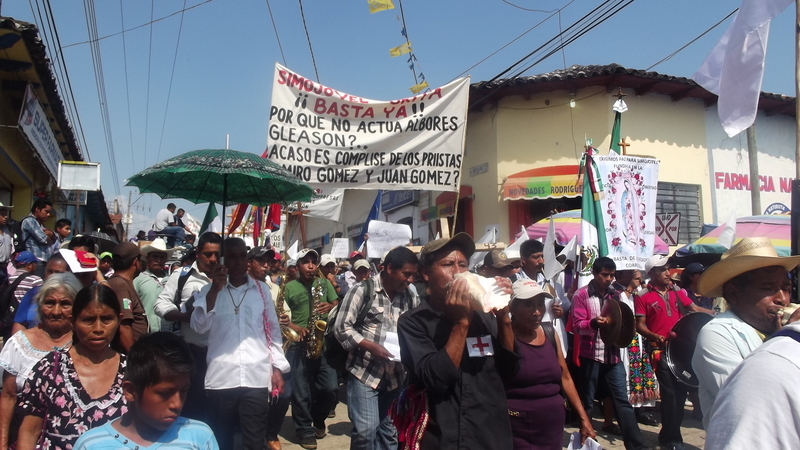 In a communique released on April 13 by the Believing People of Simojovel, the movement’s members denounce an increase in the threats, persecutions, and harassment against their priest, Marcelo Pérez, as well as against members of the Parish Council and the Believing People from this municipality. These acts were exacerbated by a mass-march held from March 23 to 26, which ended with the participation of thousands in Tuxtla Gutiérrez, the state-capital of Chiapas. Providing a larger historical account, the Believing People reviewed the latest incidents, including the fact that a million-peso bounty has been placed on Marcelo, in addition to the presence of armed groups near the location where the Parish Council carries out its activities, the threat to “do as in Acteal,” as well as the arbitrary arrest of the catechist who read the press-release before the start of the pilgrimage. This entry was posted on Friday, April 24th, 2015 at 11:09 am and is filed under Uncategorized. You can follow any responses to this entry through the RSS 2.0 feed. You can leave a response, or trackback from your own site.